In the early hours of the 16th of April, it is understood the El Wafa hospital was surrounded by Israeli Mercaver tanks. There was a battle between Palestinian freedom fighters and Israeli invaders. Five tank shells were fired into the hospital and many other 'rounds'. Miraculously, not one of the 52 patients were killed or injured but the conscious ones were very shocked. This hospital specializes in caring for severe head injuries, strokes and spinal cord injury, the majority resulting from Israeli action. There was widespread damage; the water tank on the roof flooded the hospital below. Preliminary surveys show at least 30,000 dollars worth of repairs are necessary. The charity, Helping Hands Worldwide, had approached us three weeks ago. Its supporters were keen to give support to Gaza in its suffering. They selected the Dove and the Dolphin Charity as a partner because of its track record of practical, efficient action led by Nihad Taha, our local manager. They wanted to work through us in an entirely co-operative way. Then this terrible thing happened to the Al Wafa hospital, its patients and staff. Helping Hands decided to appeal for help for the Al Wafa. Shukran. Please do all you can to blunt the physical and mental pain. 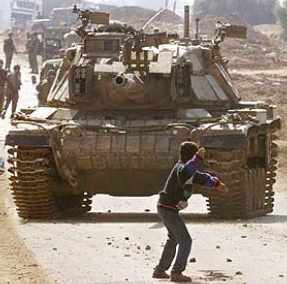 Photo - Fares, 14, with stone October 29 2000 Gaza. He was shot dead 2 weeks later.